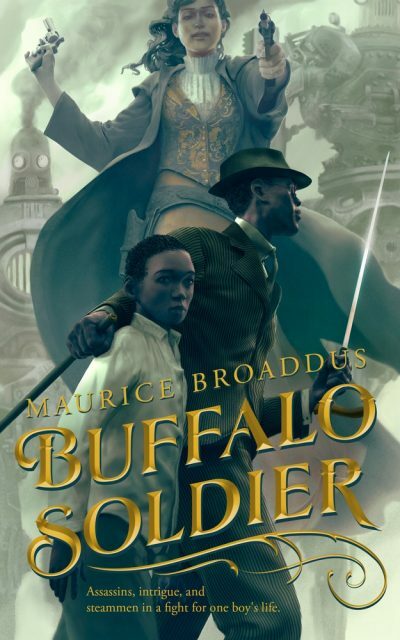 Maurice Broaddus’ 2017 Buffalo Soldier is a steam-punk western. It will be published in April. Desmond Coke and Lij Tafari appear to be father and son, just a pair of migrant workers making their way across the Tejas Free Republic in search of employment. Jamaica and Albion’s agents know the truth: Lij is a treasure their master are determined to possess and Desmond is an impediment to be removed. Desmond’s ability to pass as something other than the trained agent he is is sadly sub-par. No sooner do he and the boy reach the backwater town of Abandon than local magnate Garrison Hearst marks Desmond as someone worth a closer look. In fact, Hearst is well informed about Desmond and the boy he guards and keen to exploit the opportunity chance has handed him. Evading Hearst and his agents forces Desmond to accept the help of a Pinkerton agent despite the certainty the agent is only helping Desmond and Lij long enough to capture the pair for Albion. Even if the Jamaican can dance out of the way of the agent’s inevitable betrayal, even if he and Lij can make their way to beg sanctuary from the Five Civilized Tribes, there is no guarantee the Tribes will grant it. Sanctuary will be at best a temporary respite. Desmond has chosen his moment poorly. Albion, ever eager to expand its North American territory, has been probing the border with the Tribe. Recovering Lij for their masters may be all the casus belli Albion needs to justify invasion. As previously established, I am not a fan of the specific subset of alternate history known as steampunk. For some reason, I can accept nonsense like faster-than-light drives, telepathy and habitable Marses—not to mention things like giant humanoid robots over in anime-land—but for some reason implausibly effective steam-powered machines kill my willing suspension of disbelief. It’s like accepting talking snowmen but not talking snowmen who can fly. Alternate history authors have a choice between revealing the point of departure that led to their divergent world or not revealing it. Either choice has its risks. Not explaining what happen can leave readers confused or convinced the background makes no sense. I call this the John M. Ford option. Alternatively, they can provide an explanation, at the risk of bringing the narrative to a halt while raising the question of why the people embedded in a particular history need to have it explained to them. It’s as though I suddenly expounded on how our current circumstances trace their causes back to the Peace of Westphalia. The explanations draw attention to the fact the story is, well, a story. In this case, Broaddus opts for the second option. I suspect it’s because he didn’t trust his audience to trust him to have a reason why there would be a Five Civilized Tribes polity nowhere near their history territories. I didn’t particularly buy his alternate history1 but since actual history involves details like the current American President being the meat-puppet of a guy who helped inspire Pauly Shore’s Biodome, I am probably being unfair to expect plausibility from humans in any timeline. I will give him points for coming up with a plausible work-around for the epidemiological challenges faced by First Nations. Being the age I am and having read as much genre as I have, everything reminds me of something else (thus the endless digressions). I was surprised by what work this steampunk Western reminded me of. Presumably the author didn’t start off with asking “what would Dune have been like had Duncan Idaho managed to retrieve Paul from the machinations of the Bene Gesserit and FATE!” Lij was created for a purpose. The people who created him did for their own benefit, not the boy’s. Similarly, none of the factions so desperate to seize Lij care about the boy. Vivisection is a very real possibility if Desmond fails and failure very much seems to be an option. Buffalo Soldier is available for pre-order here. 1: The American revolution seems to have failed but there’s still a Canada. I can think of a couple of explanations (the Seven Years War ended differently, it turned out to be easier to administrate New France entirely apart from the Anglo bits of British North America and so on) but did the author. Or did they just have Canada because a world without a Canada is not worth living in? I don’t know.